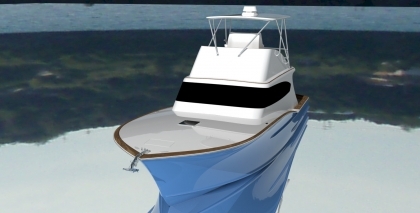 Introducing the ENVIBOATS 46 - "Blue"
The first of our new 46s will be built on the Caribbean island of Curacao. That island is getting to be a hotbed of custom ENVIBOATS. This makes four on the island. She is going to be a family boat. She features a spacious v-berth owner's cabin forward with some full size bunk beds to port for the kids. She is a galley up configuration and lots of entertaining room in her salon. Our new 35 will one day be plying the waters off Virginia doing what her name suggests. Her builder knew what he wanted and here is the result. Register to watch her come together in our Builders' Forum. This boat was co-designed by ENVIBOATS and the renowned design firm Donald L Blount and Associates (DLBA). She is sure to run fast, smooth and economically. 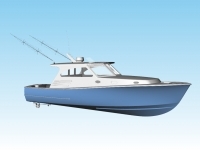 She is designed for family comfort forward and serious sportfishing aft. 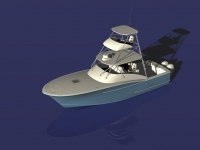 The owner of Hull #1 is a very experienced captain of a 60 Carolina-style sportfishing machine that was designed by DLBA. He loves the way she runs and loves our styling and support so he put a great team together to collaborate on his personal craft.